Amy, that's really cool! I watched Patsy when I was first learning FMQ. These types of techniques are the reasons I follow you! Thanks!!! Thanks for mentioning me! I've bought my ruler feet, but have yet to have a chance to try them out. Hope you feel better soon. Becki, I am so thankful that you opened the door for me to get to know Patsy! Have you seen the feet sold by Finishing Touches? I had one for my brother when I had it on a frame. I don't see why it wouldn't work on a table. Yes, I have and I’ve mentioned them here before. The main one they have for domestic machines is a modified Juki foot. The interesting thing that I’m recently finding (as is Patsy) is that feet are promoted for certain machines, but will actually fit on many different machines if one is willing to try it and do some adjusting. The main thing is to choose a high or low shank foot. Thanks for bringing them up again, though! Thanks so much for introducing me to Patsy and her blog. I appreciate your generosity of spirit and have learned so much from following your blog and watching your tutorials. I am eager to learn to do ruler work but have been a little hesitant to order a foot because of the price and because there was not a ruler foot made specifically for my Brother machine. This video gives me courage to save my $$ and try it out! I hope you are feeling better quickly! :( Sorry to hear you are sick again....I home schooled our daughter for years and went through the same thing when she started attending public school again. Hang in there, next year will be easier! I made a comment but not sure if it got through. I am very intrigued with the ruler work. I just got a Brother 1500S a few months ago and have been getting the sewing area set up to work. Will these Janome feet work with my machine? What do I need to purchase if they do work? Thanks for all the help and the great work you do. It is very inspiring to a new (old) quilter! Kathy- I can't say for certain as I do not have experience with the Brother 1500, but I believe it will take the Janome Convertible Free Motion Foot set for the Janome 1600P (Part # 767433004). 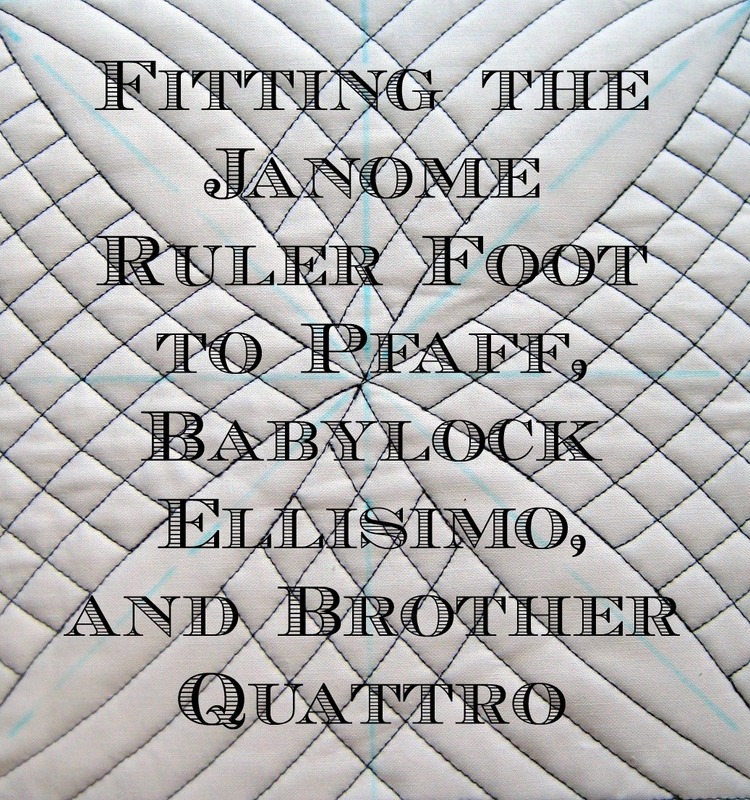 Then of course you can use the ruler toe from Janome. But that foot is packaged with the needle plate for the 1600 so it might be more expensive. It is also possible that one of the feet sold by Finishing Touches (see comment above) may fit it. CORRECTION: It was a glitch on PayPal and shipping is $5.50! Much more reasonable! However, $75.50 is still a bit above my current price range. Add in the ruler and it would be a pretty expensive experiment!